Just revisited my blog here & found all posts marked as being by "Vanessa Under" which does seem a tad odd. So I decided to write this via the dashboard, to see if that comes out the same way. I am sure the posts didn't display in that manner when I first created them! Day 4 of my Nexus 7 experience. So far, so good.I have an iPad2, so a lot of my efforts so far have been spent ensuring that the basic things I have come to depend on with the iPad are replicated on the N7. I also have an Android phone so I wanted to have some correlation to things I have on there. I use the iPad for recording music, so have quite a few apps on it that I wouldn't want put on the N7, partly because of its reduced storage, but mostly because it is smaller and realistically, for me, the iPad is about as small as I would want to go in terms of screen size when editing tracks.I have found a reasonable note-taking app, a markdown text editor, a journal and quite a few things that give me similar functionality to what I have on the iPad. Some of the apps aren't as full-featured (thinking of a couple of markdown apps I have, which I love). To be honest, I also have little interest in installing programming apps either. I will stick with the iPad for those. Broadly then, I have a device with a simply stunning screen, which fits in my handbag much more easily and is considerably cheaper than an iPad mini, which was the other option.So far, so good, as the saying goes. I think the killer feature so far has to be the excellent keyboard. The ability to swipe out your words is beautifully implemented here. My only previous experience of something familiar was on my old Galaxy S, when it was inaccurate and froze up regularly. The N7 gets it pretty much spot on, in my opinion. I think Apple is missing a trick on this.Addendum: had a little strop when I discovered my preferred Android ADN app didn't support 2048 characters in messages, but I have found one that does,for a whole 99p. That's good, given my support to another dev. I will admit to having right of centre political views, though possibly not exclusively. I certainly don't agree with all the views of any one political party in the UK today.At the moment what does irritate me is the persistent demonisation by the current Government of the whole of one sector of the workforce: the public sector. Apparently the public sector in its entirety is work-shy, overpaid and lazy. They are pariahs and the public sector is to be avoided at all costs, with the notion of service replaced with one of profit.Yes, call me biased. After all the first 9 years of my working life was spent in the public sector - local government to be precise. I have spent the years since then working in the private sector, on local government contracts. I have worked with councils to provide efficiencies and cost savings, using technology to deliver services at reduced cost. Using the private sector allows councils to bring in investment in technology in a way they could not afford on their own. It is a win-win most of the time.The previous government expanded the public sector and increased historically low pay. It allowed them to report high employment, but was not affordable or sustainable. So the next government sought to point this out by demonising the workforce, as they have done with welfare. They have highlighted some isolated cases and incidents, presenting these as the norm. I agree there is always room for a provider of a service to improve and innovate, but now councils are in a position where their budgets have been cut so far that they have no money. They need money, and staff, to deliver services to their communities; something they are well placed to do. Yet there is constant interference from bloated central government departments who seek to deflect attention from their affairs (DCLG & DWP, yes, you).Give the councils the tools to do their jobs, allow them to run their communities & who knows, a sense of harmony and community might prevail. After having been on ADN for a while and joined in/listened to some conversations, and after a conversation with a friend over dinner this week, I decided to investigate domain names. I wasn't too surprised to find my real name not taken, as it isn't a common name (although I do know of someone else with the same name). So I grabbed the dot-co-dot-uk variant. While I was there I looked for domains with hazardwarning & found dot-com & dot-co-dot-uk were taken: I wasn't surprised at that at all. So I opted for a reasonably-priced dot-me-dot-uk one. Now I have these for the next 10 years. I have put a very basic web page up for hazardwarning, which just has links to ADN, Twitter and Wordpress, all of which share this username. I haven't added 10centuries yet - I would need to find out how first. I imagine I can edit the wp link code - by now it should be pretty clear that I am fairly clueless when it comes to the wider web! I thought perhaps it was time to learn. I haven't got any web hosting per se (the domains come with 3 pages, email accounts & a blog, all of which should keep me busy for a while). To be honest I don't really see that I have the need for a full website really; not at the moment anyway. My more technically-minded brother has muttered things like "email server" - I left him pondering such things! During all this I discovered that my initials were not taken as a username on ADN. They are now. Only as a wee free account. Someone asked me if I was going to change my username, but I had decided not to. As I said earlier, the hazardwarning username seems to have become my web presence now, so I'm sticking with it - despite someone on Twitter begging me to give it up, so he could have it. Something to do with being a fan of a footballer called Hazard, that I had never heard of. 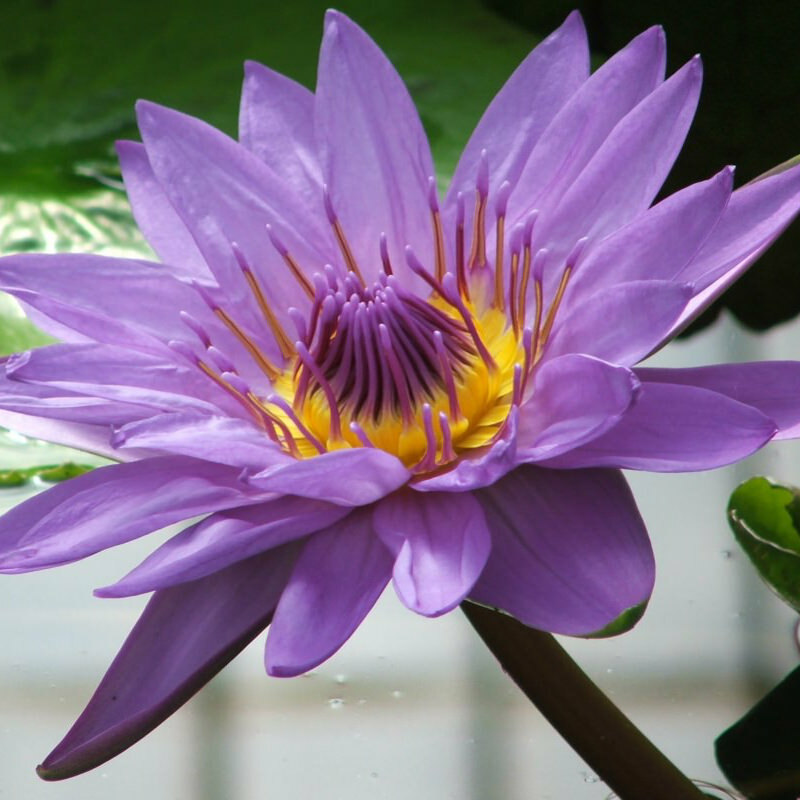 Onwards and upwards (or should that be "outwards") into the wider web world…. Ok, so I fibbed a little. 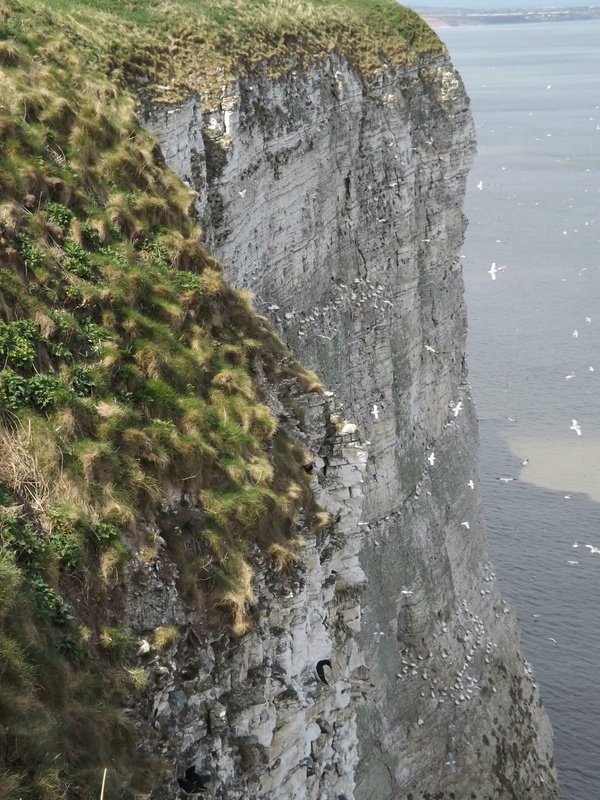 Another favourite photo - from Bempton Cliffs in Yorkshire, earlier this year. Last one today, I promise….. 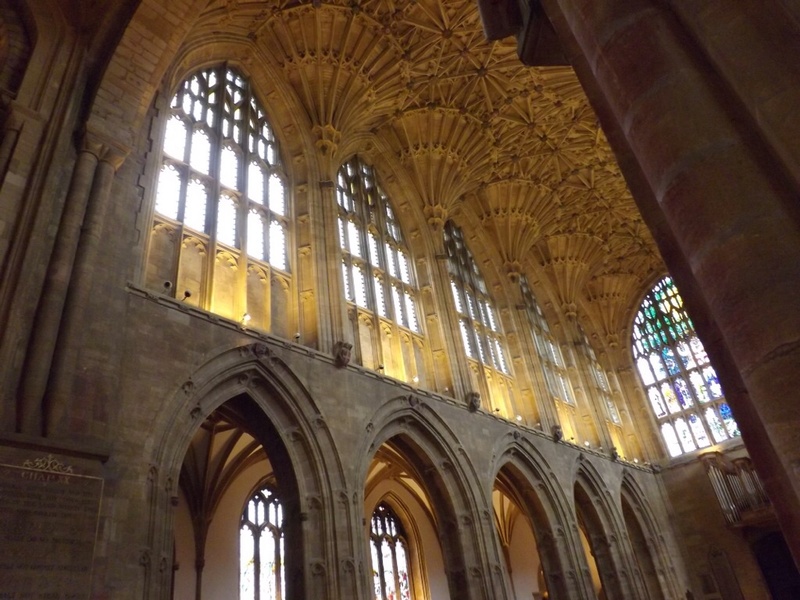 The abbey is made of a beautiful, dark yellow-brown stone. As is most of Sherborne it seems. I love to photograph stained glass windows. It started really because I took some photos in Wimborne Minster and my mother used one to make a card for a friend. Since then I have always looked for a good shot. 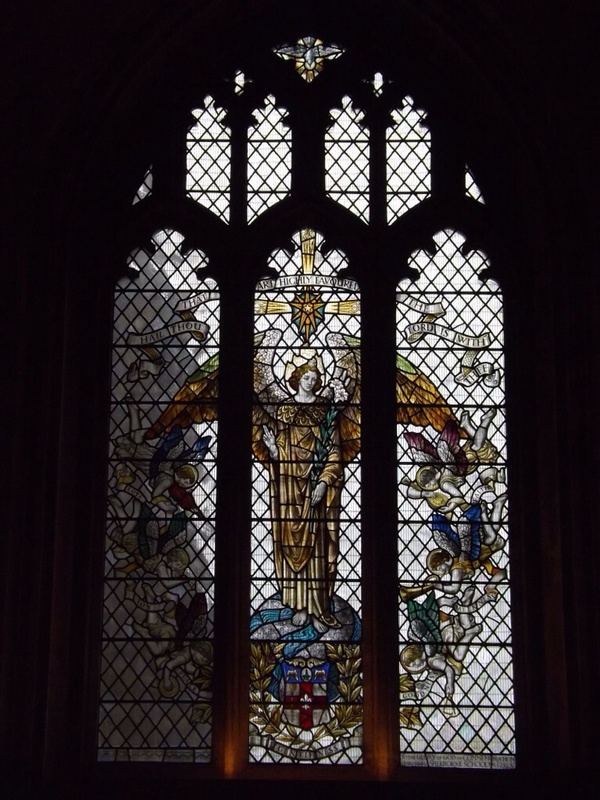 She was with me yesterday in Sherborne and particularly wanted this window. Unfortunately there is a tree outside, so no way to avoid the shadow. Beautiful window all the same (one of many). 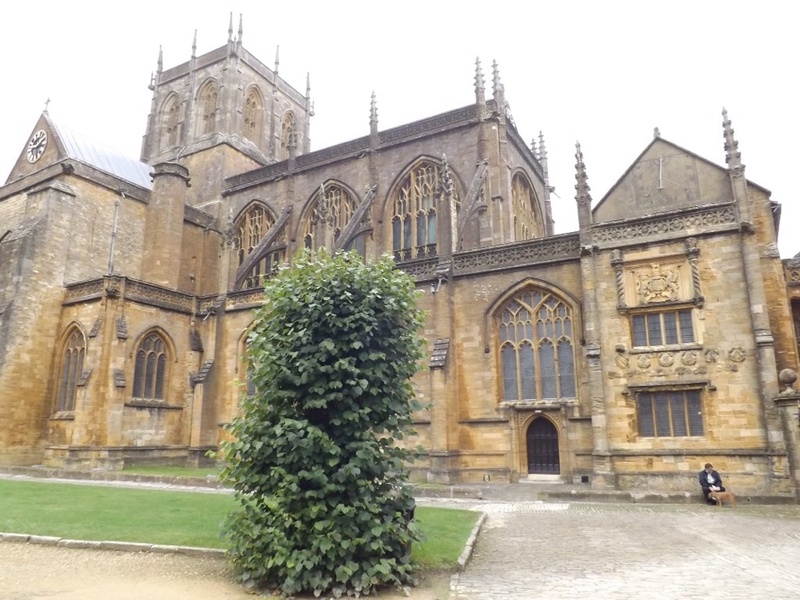 Despite some dismal weather (though not as bad as it is today) I visited Sherborne. Had a lovely lunch in a cafe called The Three Wishes, then visited the abbey, camera in hand… What a beautiful place. Far more ornate than I expected. A bonus was that someone was playing the organ, so got to hear the full power of organ music filling the church. So…. to get me started (hope it works), a photo taken on Bournemouth beach a couple of weeks ago. 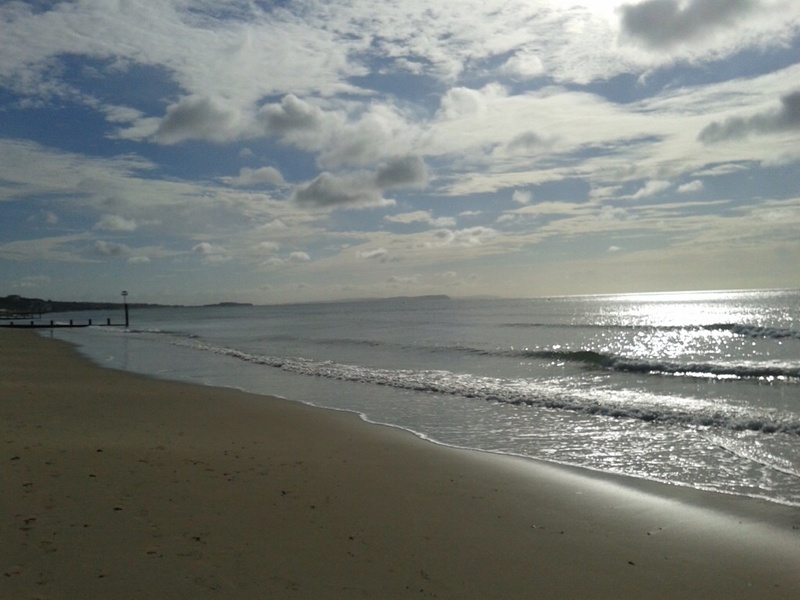 Early morning, glorious sunshine, beach just recently raked, still empty of people. What could be better.